Verderflex provided a cost effective solution to a Swiss airport that had been experiencing significant problems with their water softening treatment. The local water supply required treatment to prevent scaling in the pipework. The existing treatment system required a salt solution to be dosed from a storage tank close to the pumps over a 350m pipe-run to the water supply. The piping system had a series of valves and pipes which were not sealed correctly when they were installed and the pipe work contained a large proportion of air. Consequently, although the magdrive pumps which were transferring the solution were of good quality, intermittent use meant they ran dry, leading to bearing failure. These mag drive pumps had to be replaced every 3 months, resulting in plant downtime and high maintenance costs. Due to the scale of the airport’s construction and layout, it was not possible to install new pipe work and valves and a far more robust pumping solution was required which would not only dose the solution accurately, but also one that required less maintenance when compared to a mag drive centrifugal pump. 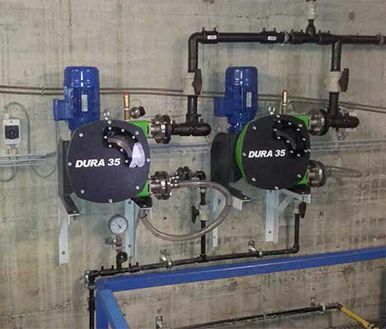 Verderflex’s local distributor recommended a Verderflex Dura 35 peristaltic hose pump for this application. A peristaltic pump consists of a hose, which is housed in a casing and squeezed by a rotor. As the only part in contact with the fluid is a flexible hose, the pump can run dry and certainly tolerate air in the pipes. The pump itself was sized to run slowly, so as to increase the hose life. The estimated running time of less than 1200 hours per year with one year between hose changes was considered extremely favourable. The Verderflex Dura brand is well established in the water and wastewater industry for the delivery of abrasive and corrosive solutions such as lime chemical, sodium hypochlorite and sodium hydroxide.